4. TWO Rockville RW10CA 10" 800 Watt Under-Seat Slim Amplified Car Subwoofer for back of seats. What do you guys suggest for the door speakers and rear? I have read that door speakers are subwoofers and are 5.25 in. Some small subs are the Tang Band W5-1138SM 5-1/4" Neodymium Subwoofer however I am already putting in the two Rockville subs. I want a CLEAR/CRISP system with a bit of bump. Would a better fit for doors be Focal Integration ISC 130 as they are on sale right now. Any suggestions for rear speakers aswell? Should I go with Alpine as I have them on the dash. Also what amp recommendations to run all this? I will have installer rewire system. I used 3 way component hertz in my 00. Amp is a Alpine PDX9 I think it was. Doors are 5.25 inch 6.25 will fit with modification i bought some ebay nokia door boxes and cut them up and mounted 6.25 driver in the doors. The tangs probably not needed with the subs, focal or hertz 5.25 in door would work. The stock amp only sends sub freqs so you really need to change the amp. I am running an active system no rear soeakers and honestly dont need them. I am running a 996 footwell subbox I moded and drive with the alpine. The alpine has 5 channels. So my pioneer hu controls cross over duties, and powers tweeter, the dash and doors handle mids crossed using amp crossover to split high mid low mid, the channel 5 sub. Anyway a decent 5.25 would be easier to install and work. I used Hertz for dash and door speakers. There's quite a bit of information online (RennTech, CAI, and this site) on various solutions. As you don't have the MOST system, your installation has a few more options. IMO after replacing the head unit, the amp has to be next. There are several multi-channel amps that you can use. I used Kenwood head unit and 5 channel amp. Dash speakers are Hertz 4 in coax, Hertz woofers in the doors (5.25 in) and then had the drivers in the rear deck sub changed. I used Morel 5.25 in there and then mounted the Hertz tweeters where the Bose tweeter were. I'm very happy with the sound and installation. I would suggest speaking with Rod at CAI. He's easy to talk to and a wealth of information. +1 for CAI bit pricey but solutions work as advertised so worth it. Are you sure those subs will fit under the seats? My problem is heighth so behind the seat impossible. 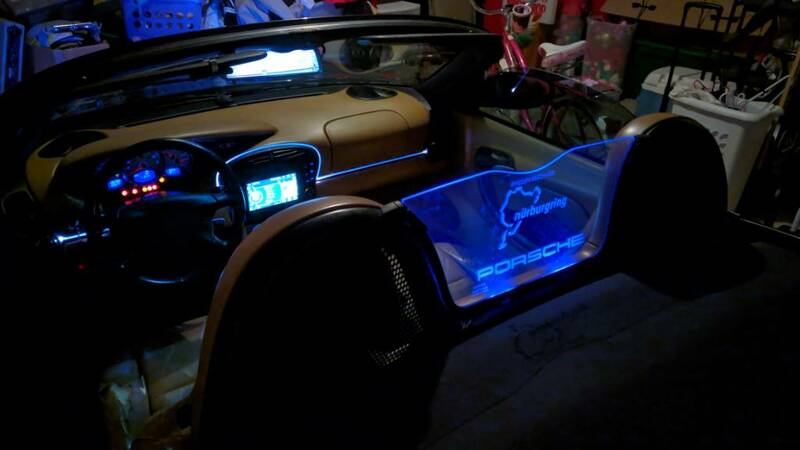 If you know someone in your area with an upgraded sound system in their Boxster, you may want to take a drive with them to see which upgrades you can actually hear. The cars are fairly noisy. The rear speakers help especially with the top down, but the other sound improvements you can hear in an audio showroom or with the car turned off may be inaudible when driving. 2. a powered sub box like Kicker, Alpine, etc. 3. A time delay (app, control on head unit, etc.) to increase soundstage and tune system to your tastes. Really made a difference for me-and it's a free Alpine app! 4. Amplify, amplify, amplify. Did I mention amplification? It's amazing how good 12 volt electronics are these days and how not a lot of $$ gets a great system to where I'm not sure spending more buys more. ..I would suggest speaking with Rod at CAI. He's easy to talk to and a wealth of information. The set-up looks cool. But where did you get the windscreen? Looks amazing man! I have the kicker hideaway 8' sub behind my passenger seat. However I may get another to put behind the drivers seat to give it some more thump. I love that windscreen also! Does it have a brand name on it by any chance? The windscreen was custom made by original owner. Has LED lights on it and can change colors. very cool! I found a company that makes them, https://www.windrestrictor.com/windrestrictor/windscreen-windblocker-windstop-windschott-lighted-engraved-logos.html. $300plus lighted version. They will etch whatever you want on it.